The Cultch Gallery, 1895 Venables Street, invites you to their opening of Epiphany in her Lair with Friends by Tom McKinnon and their 2013/2014 gallery season launch on Thursday, August 1st from 6:00 p.m. – 8:00 p.m.
Epiphany is a breathtaking series of life-size cedar sculptures, carved from trees which fell during the 2007 Vancouver storms. The series depicts plant spirits inspired by McKinnon’s nine years travelling in South America. With incredible physical presence, these statues reflect the role of narrative and image in the construction of cognition, identity, and belief. To launch their new 2013/2014 season, The Cultch Gallery will also be announcing the names of all 23 artists that have been selected for this season. You are invited to come by for a lively night of art this Thursday from 6:00 p.m. – 8:00 p.m. This Saturday, August 3rd, enjoy a free movie in the great outdoors at the Champlain Heights Community Centre, C3350 Maquinna Drive. They will be showing Madagascar 3 – Europe’s Most Wanted on a very large outdoor screen. The event gets under way at dusk (approximately 9:00 pm). You are invited to bring your lawn chair and/or blanket. This event is brought to you by Collingwood Community Policing, Champlain Heights Community Association and the Vancouver Parks Board. Yogalates is a new approach to fitness. It blends the core firming dynamics of pilates with the stretching and strengthening postures of yoga. The class is intended for all-levels and will emphasize building core strength and muscular flexibility, as well as improving balance and body alignment. Classes will be taught by registered yoga instructor, Sarah Crawford Russell, on Thursdays from 5:00 p.m. – 6:00 p.m. starting August 1st – 29th. Drop in charge is $10.00 per class, or $40.00 for 5 classes. Classes will be held at River District, 8683 Kerr Street. Looking for some fun things to do this weekend in East Vancouver? 1. Bollywood Wedding, PNE Italian Gardens, Sat & Sun. 2:00 p.m.
2. Don’t Forget Your Pants, Havana Theatre, Fri & Sat. 8:00 p.m.
3. Vancouver Symphony Orchestra, Italian Cultural Centre, Sat. 7:30 p.m.
4. A Balancing Act, Havana Theatre, Sun. 3:00 p.m.
6. Trout Lake Farmers Market, Sat. 9:00 a.m.-2:00 p.m. with yoga at 10:00 a.m.
7. Fraser River District Farmers Market, Sat. 10:00 a.m. – 3:00 p.m.
8. Kitty Nights Burlesque, Biltmore Hotel, Sun. 8:00 p.m.
9. Playland, PNE, Sat & Sun, 10:00 a.m. to 7:00 p.m.
Thief” at Fraser River District, Fri. 4:00 p.m.
10. Late Night Movie, Rio Theatre “Party Monster”, Fri. 11:00 p.m.
Gourmet Warehouse, 1340 East Hastings Street, is hosting a Bernardin Canning Workshop on Sunday, August 11th from 11:00 a.m. – 1:30 p.m. 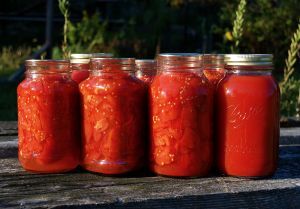 This is a demonstration workshop for all those wishing to learn about the current methods of safe home canning. The workshop includes a complete demonstration of the boiling water bath method of canning, as well as a discussion on pressure canning. Class participants will be able to sample at least 3 products which will be made during the workshop and they will get to go home with one of of the products. Darlene Tanaka leads this workshop and she will be supplying all the canning equipment and supplies for the participants. The workshop is limited to 20 people. So hop to it as their classes tend to fill up quickly. Note refunds are not offered, by you may send someone else in your place. Cost is $59.00 plus tax. If you like to plan ahead, Gourmet Warehouse has just rolled out the line up for their fall cooking classes. For more info, click on Classes. Cedar Cottage Community Cookbook – Do You Have A Recipe To Share? The Cedar Cottage-Kensington area is putting together a Community Cookbook. This is one of the most ethnically diverse neighbourhoods in East Vancouver. The idea behind the cookbook is to celebrate all the unique and delicious cuisine of the neighbourhood by collecting recipes from residents within the community. They are also inviting local restaurants in the area to submit their recipes. You can provide them with your old family recipes or new culinary creations. 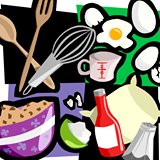 They are looking for recipes for desserts, appetizers, snacks and main courses from a variety of cultural backgrounds. They also wish to highlight origins of the recipes and what significance it holds to the contributor and within the community at large. – Indicate if it is a dessert, main course, appetizer, etc. Your submissions or any questions should be sent to: cottagecookbook@gmail.com. 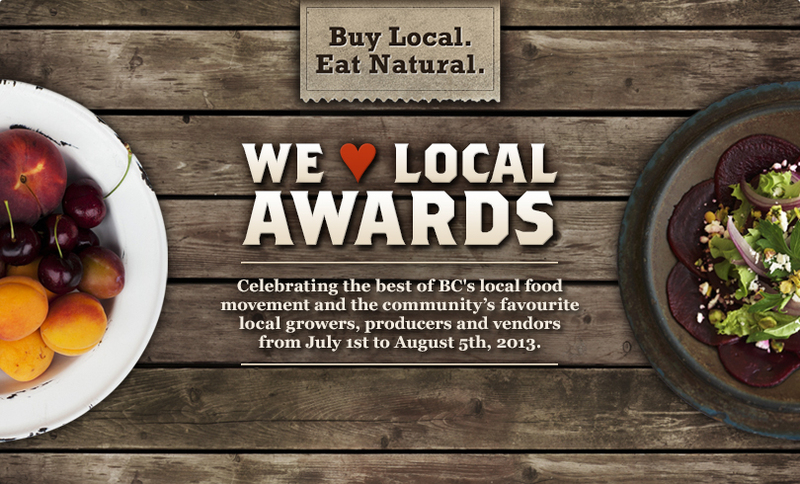 We ♥ Local Awards celebrates local food and agriculture across BC. This is a first-of-its-kind awards program which invites all British Columbians to recognize and elevate their favourite players in the food and/or agriculture industry. The nomination process is now complete. They received 237 nominations across 15 categories and voting has now begun. You can vote on Facebook up to August 5th. When you visit the page, you need to Like the page in order to vote and I guarantee you will see some East Vancouver favourites that have been nominated. Reminder, when you vote you are automatically included into a prize draw for a chance to win 1 of 20 $100 gift cards to your local Farmers Market. As well, you will have an opportunity win a weekend wine getaway at Burrowing Owl Estate Winery in Oliver, BC. To vote for your favourites, visit BuyLocalEatNatural.com now. Vote today and support your local talent!